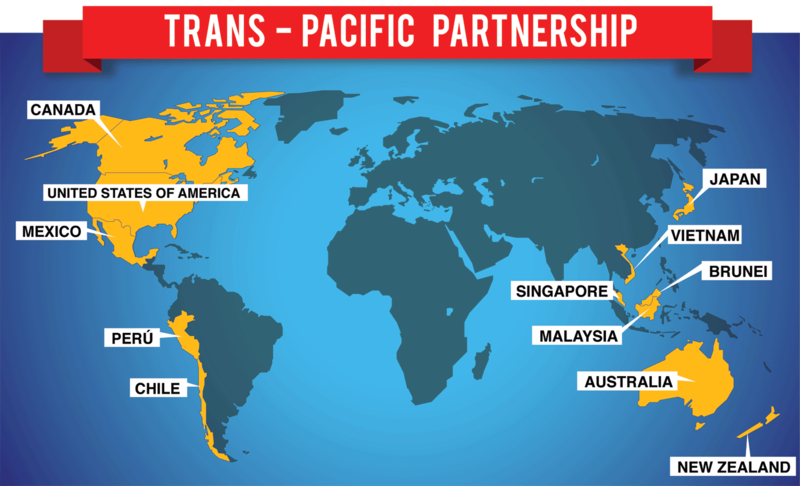 In the coming months, it is incredibly likely that the Congress and the President will try to join forces and pass the Trans-Pacific Partnership (TPP). It appears as though the Congress is preparing to give Obama fast-track authority to negotiate the agreement, which would then allow the president to submit the deal to the Congress for approval without the possibility for amendments or even significant analysis. If this happens, the TPP could conceivably be passed into law very quickly, in a way that is very difficult to stop and nearly impossible to repeal. If passed, the TPP will have immense consequences and will affect approximately 40% of the entire world’s gross domestic product (GDP). It would govern trade in 12 nations—Australia, Brunei, Canada, Chile, Japan, Malaysia, Mexico, New Zealand, Peru, Singapore, the USA and Vietnam—and more nations may sign on once it is finalized and appears ready for signatures. Put simply, this trade deal is a disaster that must be stopped at all costs. 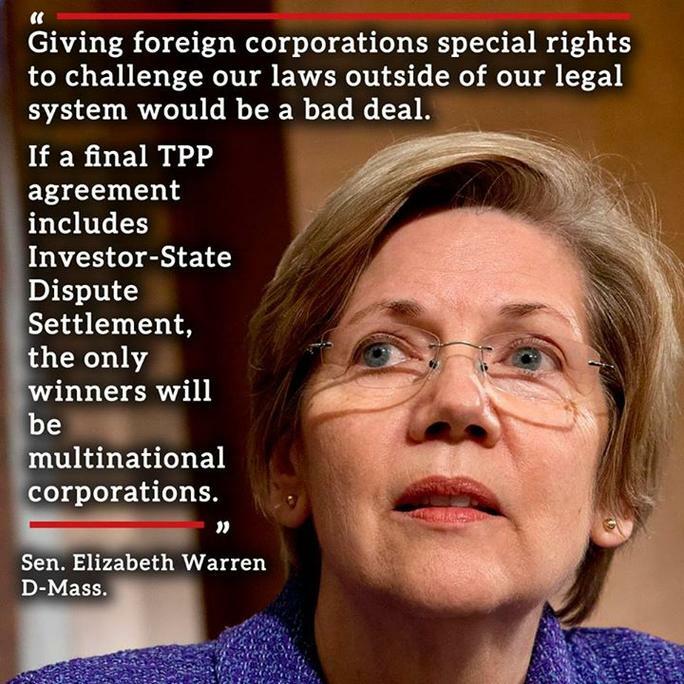 The TPP is a corporatist’s dream which is being backed by the largest multi-national corporations on the planet. It isn’t a partisan issue and will establish policies that are toxic to true progressives and conservatives. While the public hasn’t been given access to most of the document—it is being negotiated by state department officials and corporate lawyers—there have been several leaked sections posted by WikiLeaks that paint a terrifying picture. First and foremost, the TPP will increase the power of corporations to mount legal cases against sovereign governments, forcing nations to arbitrate policy disputes in an unaccountable system of international tribunals. These tribunals would hear cases where corporations claim that government regulations reduced “projected profits” and would allow corporations to force governments to repay the difference between projected and real profits. A rotating list of corporate lawyers would staff this tribunal system, creating a massive conflict of interests that would tilt the playing field in the favor of corporations. This section of the TPP represents a massive attack on American sovereignty that would allow international corporations to force American taxpayers to give them government welfare. It is an intersection of the conservative concern that American sovereignty will be stolen by international forces and their concern that welfare bums will live off of their tax dollars. For progressives, this section of the TPP is immensely problematic because it will allow corporations to destroy regulations, including environmental, worker, wage, and safety protections, and enrich executives at the cost of public safety. Second, the TPP will extend intellectual property rights and the ability of corporations to shut down websites that are accused of violating their patents. It would basically make it easier for corporations to patent ideas and creative enterprises, for longer, and increase their ability to crack down on competitors and those who would participate in a free flow of ideas. In effect, the TPP would also pass the website-shutdown provisions from the SOPA bill that were so offensive that they led several sites to shut down in protest (ex. Wikipedia, Google, etc.). This section of the TPP represents a rejection of the free market, where corporations are allowed to use government power to protect their products from competition for decades. To give you perspective on the scope of this expansion, one draft of this section expanded the intellectual property rights provision from life of creator+50 years to life or creator+100 years for created characters (ex. James Bond). 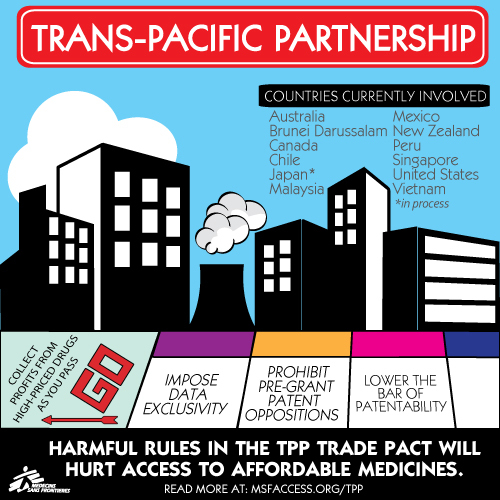 Third, the TPP will expand patent rights of big-Pharma corporations, giving them more power to fight against generic drugs and even to patent medical procedures. Specifically, the TPP will dramatically increase the ability of big-Pharma to “evergreen” their drugs by tweaking the formula in unsubstantial ways in order to extend their patents and block competition. Just as with intellectual property, these expansions of medical patent-powers will decrease market competition and allow corporations to use government power to back up their products—they don’t need to innovate, just as long as they can keep maximizing profits by blocking competition and forcing the public to accept their existing goods. From a progressive perspective, this provision is anathema, as it will result in increased medical costs for vulnerable people across the world and the prioritization of corporate profits over human life. These three provisions are just a selection of provisions that could be found in one corner of the TPP agreement (the one dealing with patents and legal challenges). Nobody knows what else might be hidden in the law, as the full text has been held away from the eyes of the public and even our elected representatives. Even with the lack of information about the entire trade deal, the provisions that we do know are so objectionable that they would absolutely kill the law if it were to be publically debated. Unfortunately, corporations have bought large portions of our government, and are using their power to align the Republican Congress with the Obama presidency—in doing so, they have ironically, created the one point of agreement between these two groups in recent years. The very same Republicans who have worked tirelessly to deny Obama the executive power to make agreements with Iran—a power that all presidents have had—are the ones who are working to give him the extraordinary power to sign away US sovereignty and the wellbeing of our people through signing this terrible trade deal. Any honest progressive or conservative can identify truly awful provisions in this TPP and should oppose the agreement. Those who fail to do this are either corporatists, ignorant, or letting their partisan affiliations override their ideological commitments (ex. 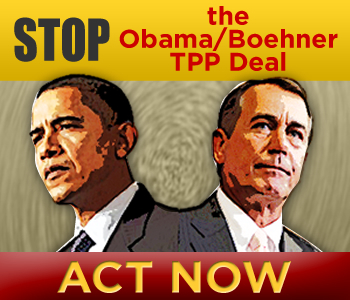 supporting the TPP because “their team” in elected office has agreed to do so). In the coming weeks, politicians and groups from across the political spectrum must put aside other political fights and work together to kill the TPP. Progressives like Elizabeth Warren (D-MA) and Bernie Sanders (I-VT) must team up with conservatives like David Young (R-IA) and Walter Jones (R-NC) to fight this agreement, even if doing so forces them to go against their own parties. Other policy fights can wait until the TPP is dead, if only because the TPP will create structural impediments to fixing those other problems in any direction that doesn’t benefit corporate interests. The TPP, EX-IM Bank, World Trade Organization have resulted in Extreme Poverty for Americans. What does this comment have to do with the above article…try nothing!